Not to be confused with propene or propyne. Propane (/ˈproʊpeɪn/) is a three-carbon alkane with the molecular formula C3H8. It is a gas at standard temperature and pressure, but compressible to a transportable liquid. A by-product of natural gas processing and petroleum refining, it is commonly used as a fuel. Propane is one of a group of liquefied petroleum gases (LP gases). The others include butane, propylene, butadiene, butylene, isobutylene, and mixtures thereof. Propane was discovered by the French chemist Marcellin Berthelot in 1857. It was found dissolved in Pennsylvanian light crude oil by Edmund Ronalds in 1864. Walter O. Snelling of the U.S. Bureau of Mines highlighted it as a volatile component in gasoline in 1910, which was the beginning of the propane industry in the United States. The volatility of these lighter hydrocarbons caused them to be known as "wild" because of the high vapor pressures of unrefined gasoline. On March 31, 1912, The New York Times reported on Snelling's work with liquefied gas, saying "a steel bottle will carry enough gas to light an ordinary home for three weeks". It was during this time that Snelling, in cooperation with Frank P. Peterson, Chester Kerr, and Arthur Kerr, created ways to liquefy the LP gases during the refining of gasoline. Together, they established American Gasol Co., the first commercial marketer of propane. Snelling had produced relatively pure propane by 1911, and on March 25, 1913, his method of processing and producing LP gases was issued patent #1,056,845. A separate method of producing LP gas through compression was created by Frank Peterson and its patent granted on July 2, 1912. The 1920s saw increased production of LP gas, with the first year of recorded production totaling 223,000 US gallons (840 m3) in 1922. In 1927, annual marketed LP gas production reached 1 million US gallons (3,800 m3), and by 1935, the annual sales of LP gas had reached 56 million US gallons (210,000 m3). Major industry developments in the 1930s included the introduction of railroad tank car transport, gas odorization, and the construction of local bottle-filling plants. The year 1945 marked the first year that annual LP gas sales reached a billion gallons. By 1947, 62% of all U.S. homes had been equipped with either natural gas or propane for cooking. In 1950, 1,000 propane-fueled buses were ordered by the Chicago Transit Authority, and by 1958, sales in the U.S. had reached 7 billion US gallons (26,000,000 m3) annually. In 2004, it was reported to be a growing $8-billion to $10-billion industry with over 15 billion US gallons (57,000,000 m3) of propane being used annually in the U.S. The "prop-" root found in "propane" and names of other compounds with three-carbon chains was derived from "propionic acid", which in turn was named after the Greek words protos (meaning first) and pion (fat). Propane is produced as a by-product of two other processes, natural gas processing and petroleum refining. The processing of natural gas involves removal of butane, propane, and large amounts of ethane from the raw gas, in order to prevent condensation of these volatiles in natural gas pipelines. Additionally, oil refineries produce some propane as a by-product of cracking petroleum into gasoline or heating oil. The supply of propane cannot easily be adjusted to meet increased demand, because of the by-product nature of propane production. About 90% of U.S. propane is domestically produced. The United States imports about 10% of the propane consumed each year, with about 70% of that coming from Canada via pipeline and rail. The remaining 30% of imported propane comes to the United States from other sources via ocean transport. After it is separated from the crude oil, North American propane is stored in huge salt caverns. Examples of these are Fort Saskatchewan, Alberta; Mont Belvieu, Texas; and Conway, Kansas. These salt caverns were hollowed out in the 1940s, and they can store 80,000,000 barrels (13,000,000 m3) or more of propane. When the propane is needed, much of it is shipped by pipelines to other areas of the United States. The North American standard grade of automotive use propane is rated HD 5. HD 5 grade has a maximum of 5 percent butane, but propane sold in Europe, has a max allowable amount of butane of 30 percent, meaning it's not the same fuel as HD 5. The LPG used as auto fuel and cooking gas in Asia and Australia, also has a very high content of butane. Propane is also shipped by truck, ship, barge, and railway to many U.S. areas. Propane can also be produced as a biofuel. Biopropane is commercially sold in Europe. Pyrometry of a propane flame using thin-filament velocimetry. 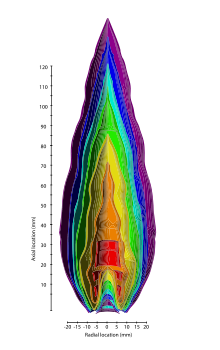 The hottest parts of the flame are in a hollow cone-shaped area near its base and pointing upward. Propane undergoes combustion reactions in a similar fashion to other alkanes. In the presence of excess oxygen, propane burns to form water and carbon dioxide. Complete combustion of propane produces about 50 MJ/kg of heat. Propane combustion is much cleaner than that of coal or unleaded gasoline. Propane per BTU production of CO2 is almost as low as that of natural gas. Propane burns hotter than home heating oil or diesel fuel because of the very high hydrogen content. The presence of C–C bonds, plus the multiple bonds of propylene and butylene, create organic exhausts besides carbon dioxide and water vapor during typical combustion. These bonds also cause propane to burn with a visible flame. The enthalpy of combustion of propane gas where all products return to standard state, for example where water returns to its liquid state at standard temperature (known as higher heating value), is (2219.2 ± 0.5) kJ/mol, or (50.33 ± 0.01) MJ/kg. The enthalpy of combustion of propane gas where products do not return to standard state, for example where the hot gases including water vapor exit a chimney, (known as lower heating value) is −2043.455 kJ/mol. The lower heat value is the amount of heat available from burning the substance where the combustion products are vented to the atmosphere; for example, the heat from a fireplace when the flue is open. The density of liquid propane at 25 °C (77 °F) is 0.493 g/cm3, which is equivalent to 4.11 pounds per U.S. liquid gallon or 493 g/L. Propane expands at 1.5% per 10 °F. Thus, liquid propane has a density of approximately 4.2 pounds per gallon (504 g/L) at 60 °F (15.6 °C). .
Propane is a popular choice for barbecues and portable stoves because the low boiling point of −42 °C (−44 °F) makes it vaporize as soon as it is released from its pressurized container. Therefore, no carburetor or other vaporizing device is required; a simple metering nozzle suffices. Propane powers some locomotive diesel engines as a fuel added into the turbocharger to give much better combustion, buses, forklifts, taxis, outboard boat motors, and ice resurfacing machines and is used for heat and cooking in recreational vehicles and campers. Since it can be transported easily, it is a popular fuel for home heat and backup electrical generation in sparsely populated areas that do not have natural gas pipelines. Many heavy duty highway trucks use propane as a boost, where it is added through the turbocharger, to mix with the diesel fuel droplets. The very high hydrogen content of the propane droplets helps the diesel fuel to burn hotter and therefore more completely. This means more torque, more horsepower and cleaner exhaust. It is normal for a 7 liter medium duty diesel truck engine to increase fuel mileage by 20 to 33 percent when a propane boost system is used. It is cheaper because propane is much cheaper than diesel fuel. The longer distance a cross country trucker can travel on a full load of fuel, combined diesel and propane, means they can maintain federal hours of work rules with two fewer fuel stops across the country. Truckers, tractor pulling competitions and farmers have been using a propane boost system for over forty years in North America. International ships can use propane fumes that evaporate from ocean going ships that transport LPG, because as the sun warms up the propane during the voyage, they catch the evaporating propane gas and feed it into the air intake system of the ship's diesel engines. This reduces bunker fuel consumption and helps the exhaust fumes to put out less pollution. This is critical for the year 2020 as there is an international agreement to use either propane or CNG as a mandatory additive to the bunker fuel, which is a very heavy oil, for all ocean traveling ships starting that year. A 20 lb (9.1 kg) steel propane cylinder. This cylinder is fitted with an overfill prevention device (OPD) valve, as evidenced by the trilobular handwheel. Propane is generally stored and transported in steel cylinders as a liquid with a vapor space above the liquid. The vapor pressure in the cylinder is a function of temperature. When gaseous propane is drawn at a high rate, the latent heat of vaporisation required to create the gas will cause the bottle to cool. (This is why water often condenses on the sides of the bottle and then freezes). In addition, the lightweight, high-octane compounds vaporize before the heavier, low-octane ones. Thus, the ignition properties change as the cylinder empties. For these reasons, the liquid is often withdrawn using a dip tube. Propane is used as fuel in furnaces for heat, in cooking, as an energy source for water heaters, laundry dryers, barbecues, portable stoves, and motor vehicles. Commercially available "propane" fuel, or LPG, is not pure. Typically in the United States and Canada, it is primarily propane (at least 90%), with the rest mostly ethane, propylene, butane, and odorants including ethyl mercaptan. This is the HD-5 standard, (Heavy Duty-5% maximum allowable propylene content, and no more than 5% butanes and ethane) defined by the American Society for Testing and Materials by its Standard 1835 for internal combustion engines. Not all products labeled "LPG" conform to this standard however. In Mexico, for example, gas labeled "LPG" may consist of 60% propane and 40% butane. "The exact proportion of this combination varies by country, depending on international prices, on the availability of components and, especially, on the climatic conditions that favor LPG with higher butane content in warmer regions and propane in cold areas". Propane use is growing rapidly in non-industrialized areas of the world. Propane has replaced many older other traditional fuel sources. North American industries using propane include glass makers, brick kilns, poultry farms and other industries that need portable heat. In rural areas of North America, as well as northern Australia, propane is used to heat livestock facilities, in grain dryers, and other heat-producing appliances. When used for heating or grain drying it is usually stored in a large, permanently-placed cylinder which is recharged by a propane-delivery truck. As of 2014[update], 6.2 million American households use propane as their primary heating fuel. In North America, local delivery trucks with an average cylinder size of 3,000 US gallons (11,000 L), fill up large cylinders that are permanently installed on the property, or other service trucks exchange empty cylinders of propane with filled cylinders. Large tractor-trailer trucks, with an average cylinder size of 10,000 US gallons (38,000 L), transport the propane from the pipeline or refinery to the local bulk plant. The bobtail and transport are not unique to the North American market, though the practice is not as common elsewhere, and the vehicles are generally called tankers. In many countries, propane is delivered to consumers via small or medium-sized individual cylinders, while empty cylinders are removed for refilling at a central location. Propene (also called propylene) can be a contaminant of commercial propane. Propane containing too much propene is not suited for most vehicle fuels. HD-5 is a specification that establishes a maximum concentration of 5% propene in propane. Propane and other LP gas specifications are established in ASTM D-1835. All propane fuels include an odorant, almost always ethanethiol, so that people can easily smell the gas in case of a leak. Propane as HD-5 was originally intended for use as vehicle fuel. HD-5 is currently being used in all propane applications. Propane is also instrumental in providing off-the-grid refrigeration, as the energy source for a gas absorption refrigerator and is commonly used for camping and recreational vehicles. In addition, blends of pure, dry "isopropane" (R-290a) (isobutane/propane mixtures) and isobutane (R-600a) can be used as the circulating refrigerant in suitably constructed compressor-based refrigeration. Compared to fluorocarbons, propane has a negligible ozone depletion potential and very low global warming potential (having a value of only 3.3 times the GWP of carbon dioxide) and can serve as a functional replacement for R-12, R-22, R-134a, and other chlorofluorocarbon or hydrofluorocarbon refrigerants in conventional stationary refrigeration and air conditioning systems. Because its global warming effect is far less than current refrigerants, propane was chosen as one of five replacement refrigerants approved by the EPA in 2015, for use in systems specially designed to handle its flammability. Vendors and advocates of hydrocarbon refrigerants argue against such bans on the grounds that there have been very few such incidents relative to the number of vehicle air conditioning systems filled with hydrocarbons. Propane is also being used increasingly for vehicle fuels. In the U.S., over 190,000 on-road vehicles use propane, and over 450,000 forklifts use it for power. It is the third most popular vehicle fuel in the world, behind gasoline and Diesel fuel. In other parts of the world, propane used in vehicles is known as autogas. In 2007, approximately 13 million vehicles worldwide use autogas. The advantage of propane in cars is its liquid state at a moderate pressure. This allows fast refill times, affordable fuel cylinder construction, and price ranges typically just over half that of gasoline. Meanwhile, it is noticeably cleaner (both in handling, and in combustion), results in less engine wear (due to carbon deposits) without diluting engine oil (often extending oil-change intervals), and until recently was a relative bargain in North America. The octane rating of propane is relatively high at 110. In the United States the propane fueling infrastructure is the most developed of all alternative vehicle fuels. Many converted vehicles have provisions for topping off from "barbecue bottles". Purpose-built vehicles are often in commercially owned fleets, and have private fueling facilities. A further saving for propane fuel vehicle operators, especially in fleets, is that pilferage is much more difficult than with gasoline or diesel fuels. Propane is also used as fuel for small engines, especially those used indoors or in areas with insufficient fresh air and ventilation to carry away the more toxic exhaust of an engine running on gasoline or Diesel fuel. More recently, there have been lawn care products like string trimmers, lawn mowers and leaf blowers intended for outdoor use, but fueled by propane in order to reduce air pollution. 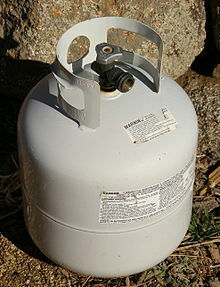 Propane and propane cylinders have been used as improvised explosive devices in attacks and attempted attacks against schools and terrorist targets such as the Columbine High School massacre, 2012 Brindisi school bombing, the Discovery Communications headquarters hostage crisis and in car bombs. Propane is the primary flammable gas in blowtorches for soldering. Propane is used as a feedstock for the production of base petrochemicals in steam cracking. Propane is the primary fuel for hot air balloons. It is used in semiconductor manufacture to deposit silicon carbide. Propane is commonly used in theme parks and in the movie industry as an inexpensive, high-energy fuel for explosions and other special effects. Propane is used as a propellant, relying on the expansion of the gas to fire the projectile. It does not ignite the gas. The use of a liquefied gas gives more shots per cylinder, compared to a compressed gas. Propane is used as a propellant for many household aerosol sprays, including shaving creams and air fresheners. Propane is a promising feedstock for the production of propylene and acrylic acid. Propane is a simple asphyxiant. Unlike natural gas, propane is denser than air. It may accumulate in low spaces and near the floor. When abused as an inhalant, it may cause hypoxia (lack of oxygen), pneumonia, cardiac failure or cardiac arrest. Propane has low toxicity since it is not readily absorbed and is not biologically active. Commonly stored under pressure at room temperature, propane and its mixtures will flash evaporate at atmospheric pressure and cool well below the freezing point of water. The cold gas, which appears white due to moisture condensing from the air, may cause frostbite. Propane is denser than air. If a leak in a propane fuel system occurs, the gas will have a tendency to sink into any enclosed area and thus poses a risk of explosion and fire. The typical scenario is a leaking cylinder stored in a basement; the propane leak drifts across the floor to the pilot light on the furnace or water heater, and results in an explosion or fire. This property makes propane generally unsuitable as a fuel for boats. One hazard associated with propane storage and transport is known as a BLEVE or boiling liquid expanding vapor explosion. The Kingman Explosion involved a railroad tank car in Kingman, Arizona in 1973 during a propane transfer. The fire and subsequent explosions resulted in twelve fatalities and numerous injuries. Propane is bought and stored in a liquid form (LPG), and thus fuel energy can be stored in a relatively small space. Compressed natural gas (CNG), largely methane, is another gas used as fuel, but it cannot be liquefied by compression at normal temperatures, as these are well above its critical temperature. As a gas, very high pressure is required to store useful quantities. This poses the hazard that, in an accident, just as with any compressed gas cylinder (such as a CO2 cylinder used for a soda concession) a CNG cylinder may burst with great force, or leak rapidly enough to become a self-propelled missile. Therefore, CNG is much less efficient to store, due to the large cylinder volume required. An alternative means of storing natural gas is as a cryogenic liquid in an insulated container as liquefied natural gas (LNG). This form of storage is at low pressure and is around 3.5 times as efficient as storing it as CNG. Unlike propane, if a spill occurs, CNG will evaporate and dissipate harmlessly because it is lighter than air. Propane is much more commonly used to fuel vehicles than is natural gas, because the equipment required costs less. Propane requires just 1,220 kilopascals (177 psi) of pressure to keep it liquid at 37.8 °C (100 °F). As of October 2013[update], the retail cost of propane was approximately $2.37 per gallon, or roughly $25.95 per 1 million BTUs. This means that filling a 500-gallon propane tank, which is what households that use propane as their main source of energy usually require, costs $948 (80% of 500 gallons or 400 gallons), a 7.5% increase on the 2012–2013 winter season average US price. However, propane costs per gallon change significantly from one state to another: the Energy Information Administration (EIA) quotes a $2.995 per gallon average on the East Coast for October 2013, while the figure for the Midwest was $1.860 for the same period. As of December 2015[update] the propane retail cost was approximately $1.97 per gallon. This means that filling a 500-gallon propane tank to 80% capacity costs $788, a 16.9% decrease or $160 less from the November 2013 quote in this section. Similar regional differences in prices are present with the December 2015 EIA figure for the East Coast at $2.67 per gallon and the Midwest at $1.43 per gallon. As of August 2018[update] the average US propane retail cost was approximately $2.48 per gallon. The wholesale price of propane in the U.S. always drops in the summer as most homes don't require it for home heating. The wholesale price of propane in the summer of 2018 has been between 86 cents to 96 cents per U.S. gallon, based on a truckload or railway car load. The price for home heating is exactly double that price, so at 95 cents per gallon wholesale, that would mean a home delivered price of $1.90 per gallon if you order 500 gallons at a time. Prices in the midwest are always cheaper than California. Prices for home delivery always go up near the end of August or the first few days of September when people start ordering their home tanks to be filled. ^ a b c NIOSH Pocket Guide to Chemical Hazards. "#0524". National Institute for Occupational Safety and Health (NIOSH). ^ GOV, NOAA Office of Response and Restoration, US. "PROPANE - CAMEO Chemicals - NOAA". cameochemicals.noaa.gov. ^ "Comptes rendus hebdomadaires des séances de l'Académie des sciences" (in French). 140. 1905. ^ Roscoe, H.E. ; Schorlemmer, C. (1881). Treatise on Chemistry. 3. Macmillan. pp. 144–145. ^ Watts, H. (1868). Dictionary of Chemistry. 4. p. 385. ^ "GAS PLANT IN STEEL BOTTLE. ; Dr. Snelling's Process Gives Month's Supply in Liquid Form". The New York Times. April 1, 1912. p. 9. Retrieved 2007-12-22. ^ "The First Fifty Years of LP-Gas: An Industry Chronology" (PDF). LPGA Times. January 1962. Archived from the original (PDF) on 2006-10-07. , Page 17. ^ "Online Etymology Dictionary entry for propane". Etymonline.com. Retrieved 2010-10-29. ^ a b Sloan, Michael. "2016 Propane Market Outlook" (PDF). Propane Education and Research Council. Retrieved 19 January 2018. ^ Argonne National Laborator (1999). "Salt Cavern Information Center". Archived from the original on 2007-12-23. Retrieved 2007-12-22. ^ Propane Education & Research Council. "History of Propane". Archived from the original on 1 November 2010. Retrieved 22 May 2012. ^ MIT Technology Review. "A New Biofuel: Propane". Retrieved 2015-07-15. ^ "Neste delivers first batch of 100% renewable propane to European market". Retrieved 3 December 2018. ^ a b Propane. NIST Standard Reference Data referring to Pittam, D. A.; Pilcher, G. (1972). "Measurements of heats of combustion by flame calorimetry. Part 8.—Methane, ethane, propane, n-butane and 2-methylpropane". Journal of the Chemical Society, Faraday Transactions 1: Physical Chemistry in Condensed Phases. 68: 2224. doi:10.1039/f19726802224. and Rossini, F.D. (1934). "Calorimetric determination of the heats of combustion of ethane, propane, normal butane, and normal pentane". J. Res. NBS. 12 (6): 735–750. doi:10.6028/jres.012.059. ^ United States Energy Information Association. "How much carbon dioxide is produced when different fuels are burned". Retrieved 2019-03-25. ^ Ҫengel, Yunus A.; Boles, Michael A. (2006). Thermodynamics: An Engineering Approach (Fifth ed.). McGrawHill. p. 925. ISBN 978-0-07-288495-1. ^ Amerigas. "Amerigas Material Safety Data Sheet for Odorized Propane" (PDF). Archived from the original (PDF) on 2011-12-09. Retrieved 2011-10-24. ^ Suburban Propane. "Suburban Propane Material Safety Data Sheet for Commercial Odorized Propane" (PDF). Archived from the original (PDF) on 2011-10-25. Retrieved 2011-10-24. ^ Mexican Ministry of Energy. "Liquefied Petroleum Gas Market Outlook 2008–2017" (PDF). Mexican Ministry of Energy. Archived from the original (PDF) on 2012-05-10. Retrieved 2012-05-17. ^ "ASTM D1835 - 16 Standard Specification for Liquefied Petroleum (LP) Gases". www.astm.org. ^ "U.S. EPA hydrocarbon-refrigerants FAQ". Epa.gov. Retrieved 2010-10-29. ^ "MACS bulletin: hydrocarbon refrigerant usage in vehicles" (PDF). Archived from the original (PDF) on 2011-01-05. Retrieved 2010-10-29. ^ "Society of Automotive Engineers hydrocarbon refrigerant bulletin". Sae.org. 2005-04-27. Retrieved 2010-10-29. ^ "Shade Tree Mechanic on hydrocarbon refrigerants". Shadetreemechanic.com. 2005-04-27. Retrieved 2010-10-29. ^ "Saskatchewan Labour bulletin on hydrocarbon refrigerants in vehicles". Labour.gov.sk.ca. 2010-06-29. Archived from the original on 2009-07-01. Retrieved 2010-10-29. ^ "New South Wales (Australia) Parliamentary record, 16 October 1997". Parliament.nsw.gov.au. 1997-10-16. Archived from the original on 1 July 2009. Retrieved 2010-10-29. ^ "New South Wales (Australia) Parliamentary record, 29 June 2000". Parliament.nsw.gov.au. Archived from the original on 22 May 2005. Retrieved 2010-10-29. ^ "Facts About Propane: America's Exceptional Energy" (PDF). National Propane Gas Association. April 2001. Retrieved December 15, 2016. ^ Hernández, Juan Pablo; Echavarría, Adriana; Palacio, Luz Amparo (2013). "Synthesis of two new Nickel and Copper- Nickel vanadates used for propane oxidative dehydrogenation". Revista Facultad de Ingeniería Universidad de Antioquia (67): 137–145. ISSN 0120-6230. ^ Zea, Hugo; Figueiredo, Jose L.; Carballo, Luis (2011). "PROMOTING EFFECT OF Mo ON Pd / g-Al2O3 SUPPORTED CATALYSTS IN THE OXIDATIVE DEHYDROGENATION OF PROPANE". DYNA. 78 (170): 159–166. ISSN 0012-7353. ^ Naumann d'Alnoncourt, Raoul; Csepei, Lénárd-István; Hävecker, Michael; Girgsdies, Frank; Schuster, Manfred E; Schlögl, Robert; Trunschke, Annette (2014). "The reaction network in propane oxidation over phase-pure MoVTeNb M1 oxide catalysts" (PDF). Journal of Catalysis. 311: 369–385. doi:10.1016/j.jcat.2013.12.008. hdl:11858/00-001M-0000-0014-F434-5. ^ Amakawa, Kazuhiko; Kolen'Ko, Yury V; Villa, Alberto; Schuster, Manfred E/; Csepei, Lénárd-István; Weinberg, Gisela; Wrabetz, Sabine; Naumann d'Alnoncourt, Raoul; Girgsdies, Frank; Prati, Laura; Schlögl, Robert; Trunschke, Annette (2013). "Multifunctionality of Crystalline MoV(TeNb) M1 Oxide Catalysts in Selective Oxidation of Propane and Benzyl Alcohol". ACS Catalysis. 3 (6): 1103–1113. doi:10.1021/cs400010q. ^ Hävecker, Michael; Wrabetz, Sabine; Kröhnert, Jutta; Csepei, Lenard-Istvan; Naumann d'Alnoncourt, Raoul; Kolen'Ko, Yury V; Girgsdies, Frank; Schlögl, Robert; Trunschke, Annette (2012). "Surface chemistry of phase-pure M1 MoVTeNb oxide during operation in selective oxidation of propane to acrylic acid" (PDF). Journal of Catalysis. 285: 48–60. doi:10.1016/j.jcat.2011.09.012. hdl:11858/00-001M-0000-0012-1BEB-F.
^ "Propane". The National Institute for Occupational Safety and Health (NIOSH). Retrieved 2016-05-12. Propane is a simple asphyxiant and does not present an IDLH hazard at concentrations below its lower explosive limit (LEL). The chosen IDLH is based on the LEL of 21,000 ppm rounded down to 20,000 ppm. ^ "Inhalants – Facts and Statistics". Greater Dallas Council on Alcohol & Drug Abuse. March 4, 2006. Archived from the original on 2009-04-08. ^ "Inhalants". National Inhalant Prevention Coalition. ^ "The Disaster Story". Kingman Historic District. Retrieved 1 July 2013. ^ "Propane Vapor Pressure". The Engineering ToolBox. 2005. Retrieved 2008-07-28. ^ US Energy Information Administration (November 12, 2013). "Heating Oil and Propane Prices". ^ Propane Deal (November 12, 2013). "Current Propane Prices". ^ US Energy Information Administration (November 12, 2013). "East Coast Heating Oil and Propane Prices". ^ US Energy Information Administration (November 12, 2013). "Midwest Heating Oil and Propane Prices". ^ a b US Energy Information Administration (December 12, 2015). "Residential Propane: Weekly Heating Oil and Propane Prices (October – March)". ^ US Energy Information Administration (August 11, 2018). "Residential Propane: Weekly Heating Oil and Propane Prices (October – March)". 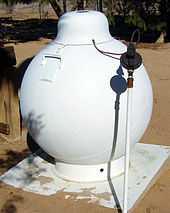 Wikimedia Commons has media related to Propane. This page was last edited on 23 April 2019, at 05:27 (UTC).